Chikkar Choolay recipe by Nazia at DesiRecipes.com. Wash the chick peas thoroughly to remove dirt. Then put the chickpeas and bicarbonate of soda in a large bowl and soak in plenty of water for several hours or overnight. Place chickpeas along with soaking water in a heavybased saucepan; add more water, if most of the water is absorbed by the chickpeas . Bring the chickpeas to boil, cover and simmer on low heat for about 40-45 minutes or until the chickpeas are 3/4 cooked. Add lentil , stir, bring to boil, cover and simmer until the chickpeas are tender but still retain their shape. This process can be speeded up in a pressure cooker. Add the finely chopped onions and ginger . Stirring frequently, fry the mixture for 5-8 minutes until well browned. Add the chili powder, turmeric , ground coriander, salt and 34 tablespoons water. Stir fry for another few minutes. Pour the cooked chick peas and liquid into the onion mixture. Stir well to mix all the ingredients and cover with a lid. Reduce the heat and simmer for 5-8 minutes or until the chick peas have absorbed the sauce. 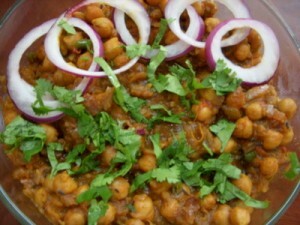 Transfer the chick peas to a serving dish, sprinkle with the garam masala and the finely chopped fresh coriander leaves . Serve hot with chapati, naan or rice of your choice.